Executive Mosaic is honored to introduce Jim Chilton, president of Boeing‘s network and space systems business, as an inductee into the 2017 edition of the Wash100 — Executive Mosaic’s annual selection of influential leaders in the government contracting arena. Chilton was promoted to the role of N&SS president in October 2016 after serving as vice president of Boeing’s strategic missiles and defense systems segment. He oversees an estimated $7 billion business with nearly 10,000 personnel across 38 states and five countries that support programs such as the International Space Station, NASA‘s Space Launch System and the U.S. Air Force‘s Minuteman intercontinental ballistic missile system and Wideband Global SATCOM satellites. The 32-year Boeing veteran also served as VP of exploration launch systems where he led the SLS heavy lift launch vehicle program. Chilton also headed the final assembly and tests of space shuttle and expendable launch vehicle payloads at Kennedy Space Center as Boeing’s program manager for the checkout assembly and payload processing contract with NASA. He started his career with Boeing in 1984 as a turbo machinery development engineer at the Rocketdyne division. Chilton also held various roles in engine test and launch operations. 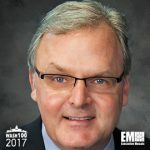 Executive Mosaic congratulates Jim Chilton and the Boeing team for their selection to receive this award.